Diamond Select have had the Ghostbusters license for ages, but for the first time, they’re actually going to make a line of figures based on the franchise — and they’re looking pretty damn awesome. 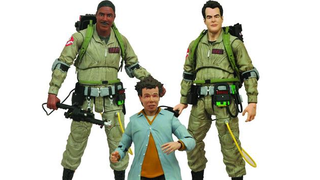 The planned line of 12 figures begins with Stanz, Zeddemore and Louis Tully (of course they’re gonna drag out the individual Ghostbusters), and like DST’s other figure lines, they stand at 7”. Each figure in the line will also come with a piece of a diorama that, once you’ve collected all 12 — oh no, my wallet — recreates the rooftop battle sequence from the first movie’s climax. Which is honestly a pretty rad addition, but man, could you imagine an in-scale Ecto-1 or something for these guys? That would be amazing. Or a build-a-figure Stay-puft marshmallow man! Basically, what I’m saying is give me all the Ghostbusters toys please. The first wave of figures is due for release in September this year, for around $23 per figure. If you excuse me, I’ll go and be the lone crazy person demanding that this line produce a Janine figure as soon as possible.